Retro Friday is a weekly meme hosted here at Angieville and focuses on reviewing books from the past. This can be an old favorite, an under-the-radar book you think deserves more attention, something woefully out of print, etc. Everyone is welcome to join in at any time! I include roundups from participating bloggers in my post every week. 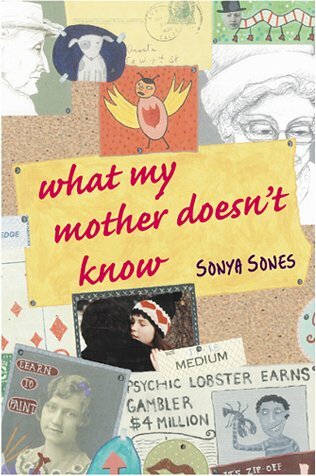 I first read What My Mother Doesn't Know a few years ago and it was my first Sonya Sones book. It was thanks to Meg Cabot's glowing recommendation that I picked this one up in the first place. 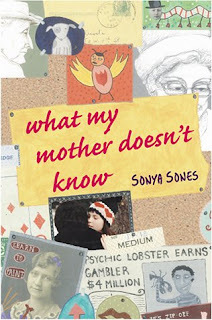 I had never heard of Ms. Sones before and I did not, at the time, realize it was a novel in verse. But I had actually recently read (and loved) Lisa Ann Sandell's Song of the Sparrow and so it only seemed a natural thing to continue on to another novel in verse, this time a very contemporary book as opposed to Sandell's lovely historical Arthurian tale. 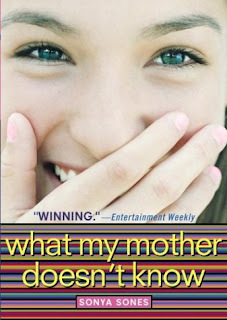 What My Mother Doesn't Know is a sweet, funny story told about fifteen-year-old Sophie and her hilarious friend Robin Murphy. It is told in a series of poems with titles that ease the reader through Sophie's days and her struggle to accommodate who she is with what she longs for. There is even a sequel--What My Girlfriend Doesn't Know --which follows Sophie and Robin and gives the reader an entirely different perspective on what is going on between these two. When I saw What My Mother Doesn't Know listed on ALA's list of challenged books, I knew it was the one I wanted to feature for this edition of Retro Friday. Because it is nothing but sweet and the opposite of a book that should be kept from readers who will find something within its pages that speaks to them. Sophie is part of the popular crowd, while Robin is....not. He's so not popular that ever since grade school his last name has been synonymous with loser or an act of extreme loserness. As in "Don't be such a Murphy." High school sure was fun, wasn't it? But the two of them share an art class and Sophie finds herself interested in sketching Murphy and he shows a similar interest in her. Nothing comes of it, due mostly to the fact that Sophie is dating the guy she believes is perfect for her. And because she has two best friends who would die at the thought of her interested in someone like Murphy. And because Sophie herself can't wrap her head around that big of a leap social standing-wise. But life at home isn't that swell, with her mother rarely surfacing from her soap operas long enough to hold a single conversation, and with her father who stiffens and bears it whenever his daughter gives him a hug. And before she knows it, life begins to change and Sophie must make her own decisions about the shape she wants her life to take and the importance of things like popularity and people. to even bother making fun of. because I want to kiss him. and his lips are tight and scared. he's never slept a second in his life. just before the news comes on. and I tapped right back. I don't know. Something about this short story got under my skin. I didn't exactly inhabit the circles any of these teens live in when I was making my way through high school. But I understood them. I knew who they were. I liked Sones' spare writing style and I really liked Sophie and Robin--two teenagers who aren't immune to all the heinous social pain/baggage that comes with high school but who learn how to watch each other's backs and make it out alive. We should all be so scrappy. I hadn't heard of this book, but it sounds really good (and really just a F U to the system I'll read any banned book). Definitely going to check it out now. Thanks for the review! oh, i completely love this book and the sequel oh-so-very much! they are such wonderful comfort reads and so teenagery in the very best of ways and perfect verse novels. back to sonya- i so wish she had a wider audience. she's got such a fantastic voice for teens and her nvels really resonate and are uplifting in sch a natural and unassuming way. I don't have my copy of it anymore, I think I loaned it to someone and never got it back. I had the one on the left though - it came from one of those school book orders I think. Great choice this week Angie! I read this one during my sophmore year of high school and it really stuck with me. I also read the sequel which I REALLY liked although some parts were a little painful for me to read--the characters go through some drama! 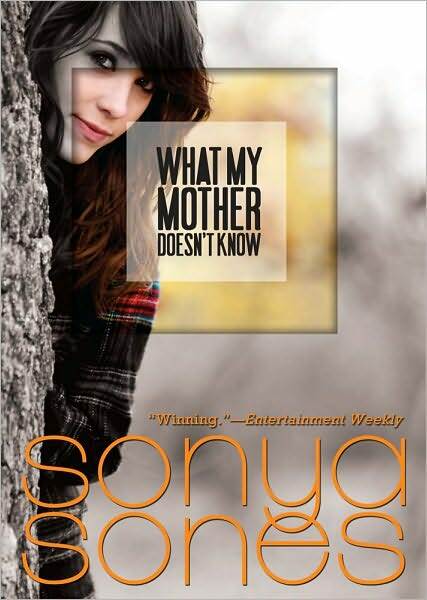 I'm surprised not that many people have read Sonya's books since they're so good! (and easy to read). I love this book! I haven't read any of the others, though, and i have no idea why since I enjoyed ths one so much. I must remedy that. Erin, awesome! My feelings exactly. Nomes, oh well said. Teenagery in the very best ways. :) I agree she deserves a wider audience. It seems like she'd be just right for so many contemporary YA readers. SONG OF THE SPARROW is absolutely lovely. I highly recommend it. Sarah, lol. I would have felt the same way had I read it first in 7th grade! I have the copy in the middle, though I really do like the newer version on the right. Pirate, I read the sequel as well and loved it. Though, as you say, it made me a bit anxious throughout as they do go through quite a bit of upheaval. Darla, you've read it! Awesome. There are just the two in this series as far as I know. But the second is well worth a read. It's from Robin's POV. I don't think I've ever read a novel in verse. This one seems pretty interesting and I like that it's a quick read. I've added it to my wishlist! I'm getting to know so many new books through Banned Books Week! This is one of them and it looks to be a winner. No idea why this would be banned, except that maybe there was a bit on HONESTY in what was written! Thanks for sharing! thank you, Thank You, THANK YOU (!!!!) for featuring this book on your blog. I finally got around to buying it (I'm searching for books to entice my reluctant readers) and consumed it in about two hours. I LOVED IT, and I never would have found it without your review. I think this might be a quintessential high school book, and I look forward to reviewing it and what my girlfriend doesn't know soon.